My previous post mentioned a serious design flaw in OC which causes confusion on cost sheet identification. There is another issue as bad as this design flaw. Missing colorways happens almost every day. All orders are subject to the colorways being placed in the product plan. Thus, missing colorways in OC means missing orders. For each valid OC, there must be a [product] plan which consists of quantities (Target Volumes), delivery date (NDC), colorways and etc. Each order is organized per row by colorway (see Sample of Plan). Some colorway rows or the whole plan data could be lost without user knowledge. At first, we thought that it was a human issue due to colorway/size category deletion for the fact that this customized version of FlexPLM doesn't perform any detection including colorway/size category that may be in use. Missing orders haunts the company since moving onto FlexPLM. Similar to the design flaw issue, it requires daily dedication to keep track of OC plans. Recently we've found that one of causes is leaving page including the browser Back and Forward buttons. If the user navigates to some other pages before the plan is saved and exited, and then returns to plan for editing, the issue of losing plan data will occur. By the time comes, the PO specialist tries to issue and approve the PO but finds missing or no orders. This missing order issue could happen anytime during OC editing or after completion. Today you find the plan look perfectly in the OC but it may vanish in a few hours, next day or even any time in the future. There is no guarantee that the entire plan data exists until PO creation. We still don't know why the plan data will be gone when no one touches it. Be sure your system could handle the situation of users leaving pages without saving data. Your UAT must include this to ensure data integrity. This problem reminds me of my time working for a marketing research company where the applications always allow people leaving pages and then quickly returning to answer the rest of questionnaires. Sample of Plan - This plan is modified for display only; simply expand it to view the plan. 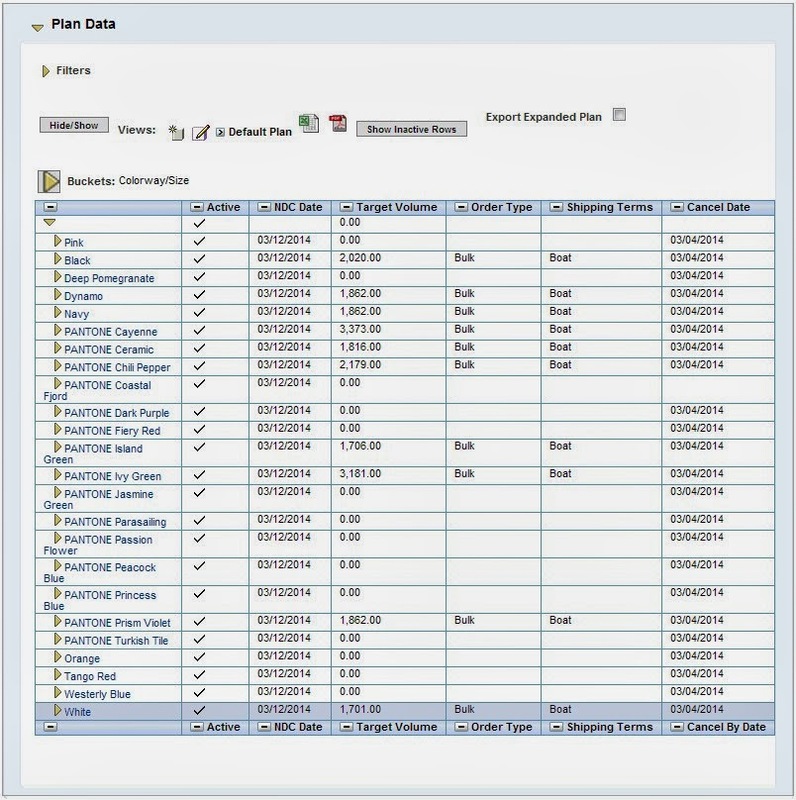 When the plan data is lost, each order (i.e., the colorway row) consists of yellow exclamation mark or the entire plan is even missing or empty. The following plan won't be seen when the problem occurs.